Everything about the Too Faced Christmas collection screams ORGANIZATION! It is very unlikely to have "organization" for a holiday theme but it works for Too Faced. In the previous years, we have seen New York, Paris & White Christmas in their holiday sets, I guess this year we are having a breath of fresh air on the theme. For this review, I will only focus on the eyeshadow palette and the planner. I'm not sure if anyone realized it... 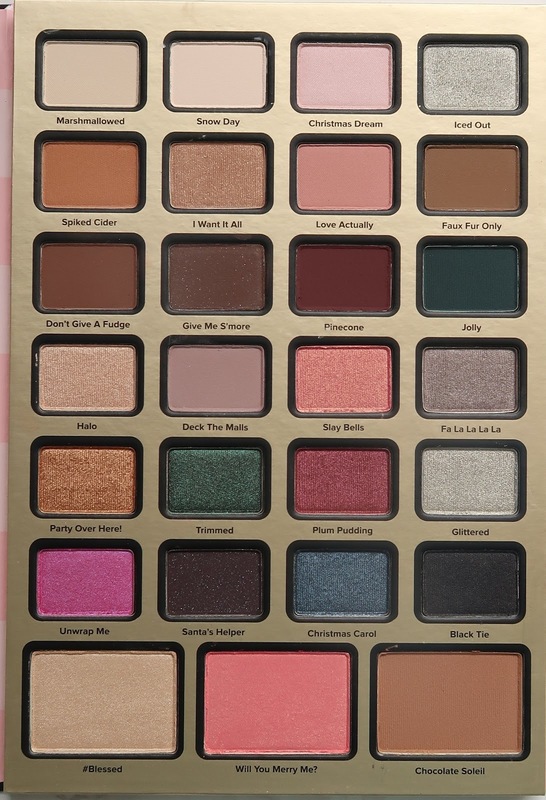 The eyeshadow palette reminds me a lot of the last year's Christmas in New York - The Chocolate Shop palette. But when I retrieve the old palette out of my drawer, I discover that this new palette is actually a combination of all the Too Faced palettes that ever produced. What a bummer! The difference is so minor that you can't tell if you're using it on your eyes. If you already have all of the Too Faced palettes before, I highly advise you to skip this. Marshmallowed and Snow Day are matte texture and both appear quite patchy and dry. Christmas Dream is a sweet pink in satin finish. While Iced Out is an aluminum silver with silver sparkles. This row contains daily wearables shadows. Spiked Cider is an orangy brown in matte. I Want It All is a muted soft sand brown with very sparse light pink sparkles, Love Actually (my favourite) is a tea rose pink, and Faux Fur Only is a dusty brown shade in matte. Don't Give A Fudge is a mocha brown in matte. Give Me S'More is a muted soil brown with sparse blue and purple sparkles. Pinecone is a muted burgandy in matte and Jolly (my favourite) is a muted royal blue. Halo (my favourite) is one of the most pigmented shadows from the bunch. It is a metallic champagne color that is very reflective. Deck The Malls is a purplish grey that is suitable for creating definition. Slay Bells is a salmon pink with tiny reflective gold particles. It resembles the shade Just Peachy from the Sweet Peach palette. Fa La La La La is a warm tone grey with tiny purple sparkles. This entire line can create a very pretty wedding look. Party Over Here! is a warm old gold tone with high reflective. It also appears to be the most buttery formula compared to the rest of the shades. Trimmed is a green satin with dark brown undertone. Plum Pudding is a maroon purple satin finish. Glittered is a silver with silver particles, very much similar to Iced Out, except it has lesser sparkles but more prominent satin finish. UnWrap Me is an unpredictable shade. On the pan, it looks like a purple, but once swatched on the hand, it looks extremely Barbie pink with a satin finish. Santa's helper is a dark olive-brown shade with tiny blue and purple sparkles. Christmas Carol is a true royal blue with grey undertone. Black Tie is a muted black, it is not very pigmented so it is good to use as a build up for smokey look. At the end of the palette, there are the bonuses - highlighter, blush and bronzer. The highlighter called #Blessed is a very reflective metallic champagne with lots of sparkles. It is one of those in-the-face highlighter that can be seen from space. Will You Merry Me? is a blush that resembles NARS Orgsm. It has a peach undertone with lots of gold sparkles. Chocolate Soleil is a matte bronzer. I'm glad they did this in matte otherwise there are too much sparkles in this pan. On the planner, I did a flip through video below which you can see for yourself. I personally think it is too juvenile and not suitable for old girls like me. I don't regret getting because it is really beautiful and I can see that a lot of work was put into getting the planner done. I just don't think that I want to use this in the public because it doesn't reflect my age. Anyway, do leave me a comment what you think about the palette or the journal. I would love to hear what you have to say.